« This is the most essential vitamin for women’s health! Each of us is looking forward to the summer. This is the time when you can relax your body and soul. Many prefer to spend their summer vacation away from home. Some people are attracted by sea holidays, while others simply want to enjoy solitude with nature in the country. Whichever option you prefer, it is important to always have at hand all the necessary things. Especially carefully you need to treat the collection of travel kits. The stomach and intestines are one of the most vulnerable systems of the human body, which are especially often subjected to additional stress when traveling and traveling because of the change of the usual kitchen and consumed products. Alcohol, exotic food, fatty meat – all this and much more can adversely affect the work of the digestive tract. Loperamide provides emergency assistance in case of intestinal and stomach disorders. Acts as quickly and efficiently as possible. In the case of food or alcohol poisoning, which is accompanied by vomiting and diarrhea, the patient should be treated with Regidron, Trihydron, etc. These drugs will help restore the acid-base balance, which is disturbed by dehydration. It should also be borne in mind that after the treatment of poisoning and disorders the intestinal microflora is disturbed, it is therefore necessary several days, and it is better to drink the bacteria Linex, Biosporin for weeks. 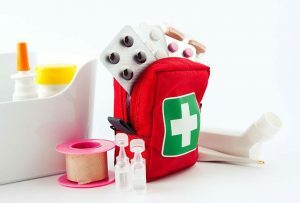 If you are leaving for a few days, you can buy these drugs on return and take it at home, and in the case of long trips, you should take them with you. The classic, affordable and most common drug Analgin, which, however, is banned in many countries due to the content of agranulocytosis and has a lot of contraindications and side effects. Paracetamol is a drug that can be taken in various dosages for adults and children. Ibuprofen is more effective but has more side effects. A glass of cold water or prolonged exposure to seawater can cause sore throat and cough. Syrups Bronholitin, Bronkhostop, Pektolvan C.
According to statistics, 75% of people who went to the sea, are subject to the negative effects of sunlight, causing burns on the body. Active drugs in eliminating the symptoms of sunburn are creams and sprays based on panthenol: Bepanten, Panthenol. Health problems may lie in wait, not only at the very rest, but also on the way to it. More low-cost counterparts of foreign drugs are Avia-Sea tablets, as well as ginger capsules. It does not mean at all that you need to take all of the above preparations on a trip. It will be enough for one position from each category, and then be sure that the summer vacation will not disappoint you.